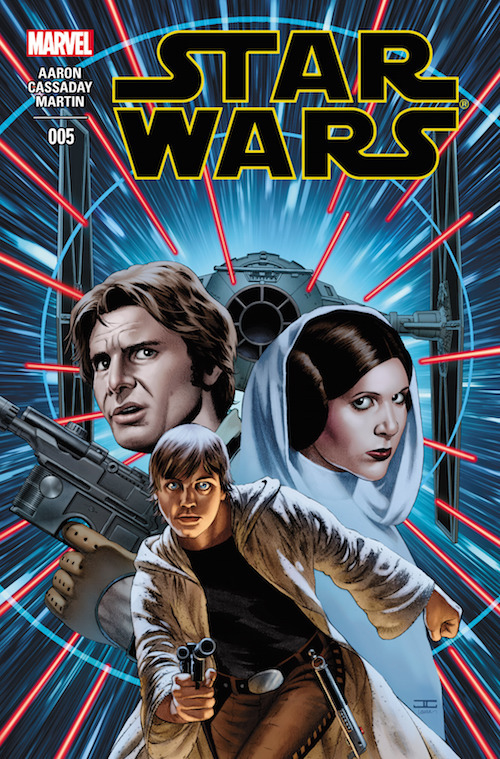 Maybe it’s just the impending arrival of Stuart Immonen, but I thought this issue was the best of the series so far. Boba Fett makes a significant appearance, on Tatooine seeking the whereabouts of the ‘mysterious pilot’ for Vader. Luke is also on Tatooine, searching for clues about Ben Kenobi and his own past in the abandoned wreck of Obi-Wan’s home, he finds something of interest, but not before someone else finds him… Han barters his services for parts to fix the Falcon but ends up being more hindrance than help. If there’s one thing that Cassaday excels at, it’s capturing the facial expressions of these extremely well known characters and that really aids Aaron in making their voice clear and distinct. The quality of this book is slowly climbing to meet my expectations and a change in artist in the upcoming months will only help that.